The buzzword “Content Marketing” is a new term for an old concept – it is about building a relationship with a customer. It means finding a way to communicate the value of your product by finding out what your target audience is interested in, and why. Just like meeting someone on a blind date, if the attraction is there you can build on it by finding out what is important to the other person. It is what is said, and how you say it, that is important. B2B marketing is more specialized and complex than selling straight to a consumer. When selling from one business to another business, you cannot always know who is making the decision to buy your product, how many opinions will weigh in on the decision to buy your product, which, if any, of your competitors they are also considering. You must be sure of your facts about the potential client’s business before you go in. It is as if you are on a blind date with the blind date’s best friend, who is vetting you before her friend meets you. The right content is so important for your message. This line of marketing is very much developing a relationship. It takes work and it is ongoing. Here are some step-by-step to help you find a sustainable and, importantly, genuine source of digital content for your marketing. This is Sales and Marketing 101. Before we start any marketing campaign, we need to look at what we are looking to achieve from our new marketing campaign. Typically, the desired effect of the marketing campaign would be lead generation and increased profits.We want to attract people and motivate them to buy our product. So, who do we want as our clients? What are they like? Look at what you are offering. What problems does your specific product or service resolve? You need to learn all about your customers for effective and sustainable content. You will want your content marketing focused, not on telling what you can do, but about your service; that you listen and care. What issues or problems are they finding frustrating or taking up time? What are they spending money on that they probably wish they weren’t? You have the solution and can the marketing campaign is to prove so. Today’s effective communication is about integration between Sales and Marketing. Find out about the customer from the people at the coalface – be it in store, out on the road or over the phone. Is there a product that consumers are requesting more often? What complaints or objections are they fielding? It shouldn’t be surprising that your sales people can come up with new and interesting things to share about the company and its clients. With time, you will see that tapping into Sales and your employees for content will prove fruitful – and have a lead-on affect of motivating your employees and helping them feel valued and excited about contributing to the public face of what they do every day. If something works, build on it. Turn a blog into an ebook, a dynamic sales presentation into a YouTube video on your website. Measuring your content marketing successes, and those not quite as successful efforts, will help guide you as you learn what tunes your audience into your product and brand. 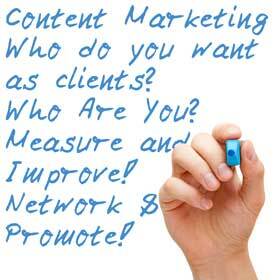 Remember, content marketing must find an audience to work. Find other business blogs and groups in your industry, organize to cross promote your blog articles or ebook. This tapping into the other business’ networks benefits both your businesses and can create another customer, in the other business itself. Importantly, find those groups, forums and blog sites for businesses that you think your content will help – after all, they are your target market as well. Tying your business to interest groups will spread your message further. If your content is effective at conveying your message, you are effectively building your relationship with your business customer.